In spotlight: A wallpaper from the movie 2012. Nasa said last week that the world was not ending—at least anytime soon. Last year, CERN, the European Organization for Nuclear Research, said the same thing, which is good news for the habitually jittery. How often do you have a pair of such blue-ribbon scientific establishments assuring us that everything is fine? CERN’s pronouncements were intended to allay concerns that a black hole would be spit out of its new Large Hadron Collider and eat the earth. The announcements by the National Aeronautics and Space Administration, in the form of several website postings and a video posted on YouTube, were in response to worries that the world will end on 21 December 2012, when a 5,125-year cycle known as the Long Count in the Mayan calendar supposedly comes to a close. The doomsday buzz reached a high point with the release of the new movie? 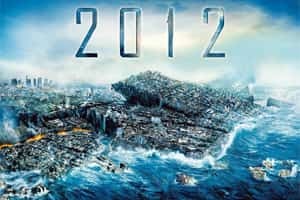 2012, directed by Roland Emmerich, who previously inflicted misery on the earth from aliens and glaciers in Independence Day and The Day After Tomorrow. In the movie, an alignment between the sun and the centre of the galaxy on 21 December 2012, causes the sun to go berserk with mighty storms on its surface that pour out huge numbers of the elusive subatomic particles called neutrinos. Somehow the neutrinos transmute into other particles and heat up the earth’s core. The earth’s crust loses its moorings and begins to weaken and slide around. Los Angeles falls into the ocean; Yellowstone blows up, showering the continent with black ash. Tidal waves wash over the Himalayas, where the governments of the planet have secretly built a fleet of arks in which a select 400,000 people can ride out the storm. But this is only one version of apocalypse out there. In other variations, a planet named Nibiru crashes into us or the earth’s magnetic field flips. There are hundreds of books devoted to 2012, and millions of websites, depending on what combination of “2012" and “doomsday" you type into Google. All of it, astronomers say, is bunk. “Most of what’s claimed for 2012 relies on wishful thinking, wild pseudoscientific folly, ignorance of astronomy and a level of paranoia worthy of ‘Night of the Living Dead’," Ed Krupp, director of the Griffith Observatory in Los Angeles, and an expert on ancient astronomy, wrote in an article in the November issue of Sky and Telescope. Personally, I have been in love with end-of-the-world stories since I started consuming science fiction as a disaffected child. Scaring the pants off the public has been pretty much the name of the game ever since Orson Welles broadcast?“War of the Worlds,"?a fake newscast about a Martian invasion of New Jersey, in 1938. But the trend has gone too far, suggested David Morrison, an astronomer at the Nasa Ames Research Center in Moffett Field, California, who made the YouTube video and is one of the agency’s point people on the issue of Mayan prophecies of doom. “I get angry at the way people are being manipulated and frightened to make money," Morrison said. “There is no ethical right to frighten children to make a buck." Morrison said he had been getting around 20 letters and email messages a day from people as far away as India scared out of their wits. In an email message, he enclosed a sample that included one from a woman wondering if she should kill herself, her daughter and her unborn baby. Another came from a person pondering whether to put her dog to sleep to avoid suffering in 2012. All of this reminded me of the kinds of letters I received last year about the putative black hole at CERN. That, too, was more science fiction than science fact, but apparently there is nothing like death to bring home the abstract realms of physics and astronomy. In such situations, when the earth or the universe is trying to shrug you and your loved ones off this mortal plane, the cosmic does become personal. Morrison said he did not blame the movie for all this, as much as the many other purveyors of the Mayan prediction, as well as the apparent failure of some people, reflected in so many arenas of our national life, to tell reality from fiction. But then, he said, “my doctorate is in astronomy, not psychology". In an email exchange, Krupp said: “We are always uncertain about the future, and we always consume representations of it. We are always lured by the romance of the ancient past and by the exotic scale of the cosmos. When they combine, we are mesmerized." A Nasa spokesman, Dwayne Brown, said the agency did not comment on movies, leaving that to movie critics. But when it comes to science, Brown said, “we felt it was prudent to provide a resource". If you want to worry, most scientists say, you should think about global climate change, rogue asteroids or nuclear war. But if speculation about ancient prophecies gets you going, here are some things Morrison and others think you should know. To begin with, astronomers agree, there is nothing special about the sun and galactic centre aligning in the sky. It happens every December with no physical consequence beyond the overconsumption of eggnog. And anyway, the sun and the galactic centre will not exactly coincide even in 2012. Geological apocalypse is a better bet. There have been big earthquakes in California before and probably will be again. These quakes could destroy Los Angeles, as shown in the movie, and Yellowstone could erupt again with cataclysmic force sooner or later. We and our works are indeed fragile and temporary riders on the earth. But in this case, “sooner or later" means hundreds of millions of years, and there would be plenty of warning. The Mayans, who were good-enough astronomers and timekeepers to predict Venus’ position 500 years in the future, deserve better than this. Mayan time was cyclic, and experts such as Krupp and Anthony Aveni, an astronomer and anthropologist at Colgate University, say there is no evidence that the Mayans thought anything special would happen when the odometer rolled over on this Long Count in 2012. There are references in Mayan inscriptions to dates both before the beginning and the ending of the present Long Count, they say, just as your next birthday and 15 April loom beyond New Year’s eve, on next year’s calendar. So keep up those mortgage payments.